Mary Tudor has always been known as ‘Bloody Mary’, the name given to her by later Protestant writers who vilified her for attempting to re-impose Roman Catholicism in England. Although a more nuanced picture of Mary has since emerged, she is still surrounded by stereotypes, depicted as a tragic and lonely figure, personally and politically isolated after the annulment of her parents’ marriage and rescued from obscurity only through the good offices of Katherine Parr. Henry doted on Mary as a child and called her his ‘pearl of the world’, her determination to side with her mother over the annulment both hurt him as a father, and damaged perceptions of him as a monarch commanding unhesitating obedience. However, once Mary had been pressured into compliance Henry reverted to being a loving father and Mary played an important role in court life. Thomas examines Mary’s life during the reign of Henry VIII and her relationship with her father. In the following piece, Melita Thomas discusses the often misunderstood and complex relationship between Mary and Thomas Cromwell. Thomas Cromwell is known as a religious reformer, a supporter of Anne Boleyn and the destroyer of the English monasteries. His views seem so diametrically opposed to those of Mary, daughter of Henry VIII and Katharine of Aragon, that it seems obvious to assume that they were political enemies. Examination of the evidence, however, suggests that their relationship was much more positive. The first time we can be sure that Mary and Cromwell spoke to each other was on 17 th January 1534 – and it was not a pleasant conversation. Henry had set out for Hatfield, where Mary was being forced to live as subordinate in Elizabeth’s household, with a view to seeing his elder daughter, and persuading her to accept her demotion to illegitimate status. Whilst he was still on the road, Anne sent a hasty message, requesting Henry not to see Mary. Knowing of the king’s affection for his daughter, she was afraid that, in her presence, Henry would relent, and not compel Mary to accept Elizabeth as heir to the throne. Anne’s messenger was Cromwell, still only Master of the Jewels, but rapidly growing in influence. Henry heeded Anne’s message, and keeping aloof himself, sent a delegation to her, consisting of Cromwell, Sir William FitzWlliam and the Captain of the Guard, Sir William Kingston. They pressed her to renounce her title of princess, but she refused. She had already rejected the idea, she said, and there was no possibility of her changing her mind, regardless of how badly she was treated. The men retreated. Cromwell was later to tell the Imperial ambassador, Eustace Chapuys, that he had been very favourably impressed by Mary on this occasion. We must bear in mind that Cromwell was willing to say more-or- less anything to pursue his objective of placating the Emperor enough to prevent him intervening to restore Queen Katharine and Mary but he does seem generally to have favoured conciliating the Emperor to preserve the important Anglo-Burgundian trading relationship. It has been suggested, by the distinguished Professor Mortimer Levine, that the exclusion of any statutory declaration that Mary was illegitimate from the Act of Succession 1534, was deliberate on Cromwell’s part. Perhaps he was thinking that an intelligent and forceful young woman whom the majority of Henry’s subjects, whatever their religious leanings, believed legitimate, was a more likely candidate for the throne than the baby Elizabeth, in the event of Henry’s early death. Throughout the period 1534 – 1536, as Henry and Anne tried to attract European support for their position, particularly from the French king, François, Cromwell continued to assure Chapuys that he personally was very sympathetic to Mary and that he would do everything he could for her. This was rather contradicted by a remark repeated to Chapuys that the minister thought the best way to ensure a reconciliation between king and emperor would be the deaths of Katharine and Mary. Whatever Cromwell’s real feelings, in May 1536, within days of the execution of Anne Boleyn, Mary wrote to him, requesting him to ask permission from Henry for her to write directly to him. We do not know why Mary thought Cromwell was her best hope of help – perhaps Chapuys had indicated in one of his secret messages that he thought Cromwell’s sympathy was genuine, or perhaps his reputation for power was so complete that Mary did not think any other of her father’s ministers would have more chance of persuading Henry. But she must have believed he would be help her, which is surprising if we take as fact the idea that he had been an avid supporter of Anne Boleyn. It is possible she had heard the rumour that Cromwell and Anne had quarrelled before Anne’s arrest, and believed that Cromwell was instrumental in Anne’s downfall, making him an obvious candidate for her plea. Whatever her reasoning, Mary was right. Cromwell was willing to help her. He obtained permission for her to write to Henry, and told Chapuys that, if Mary would only submit to the sentence of annulment on her parents’ marriage, and the replacing of the Pope with the king as Supreme Head of the Church in England, she would quickly be restored to favour and perhaps even named as Henry’s heir. He drafted a letter for Mary to send, which he showed the ambassador. Chapuys was horrified by it. Presumably, Mary was too, as she sent quite a different letter to her father. Portrait of Thomas Cromwell. Hans Hobein (1532 and 1533). Frick Collection. (Wikipedia). For some three weeks, letters passed between Mary and Henry, via Cromwell. Cromwell continually urged her to give in, whilst Mary repeated her desire to obey Henry in everything except matters of conscience. She pleaded with Cromwell to explain to her father that she had gone as far as she could, and not to press her further, although she was grateful for his ‘advice and counsel’. Eventually, Cromwell lost patience and sent Mary an angry response, telling her she was ungrateful, disobedient, and the most stubborn woman ever born. He had put himself in considerable danger by assuring Henry of her repentance, and if she did not obey, he would wash his hands of her completely. Unless she had thought better of her disobedience, he never wanted to hear from her again. This letter arrived hard on the heels of a delegation of Henry’s other Councillors who harangued her at length, one even going so far as to say that, if she were his daughter, he would beat her head against the wall until it was as soft as a baked apple. With no-one else to turn to, and fearing that the full rigour of the law would be brought to bear on her, Mary gave in. She took up Cromwell’s latest draft of a suitably submissive letter, and the articles that she was required to sign, and, gritting her teeth, put her name to them, probably only because she had been assured by Chapuys that the Pope would absolve her of her oath, given under duress. This action transformed Mary’s situation. Within days, Henry had given her permission to choose a new household – all her old servants having been dismissed in 1533. She wrote to Cromwell, expressing her gratitude for his help, and advice and saving her from being ‘almost drowned in folly’. Cromwell sent her a horse, at which she expressed great pleasure, saying how much she had missed riding in the previous three years. She repeated her thanks for his intervention with Henry, and his advice. Cromwell now indicated to Chapuys that Mary would be named in the forthcoming Parliament as heir to the throne after any children Henry might have by his new wife, Jane Seymour. He was either mistaken or disingenuous. The Act of Succession of 1536 was the first statutory declaration that Mary was illegitimate. From this time forward, there was regular correspondence between Mary and Cromwell that suggests a level of good will beyond just courtly politeness. She sent her servant, Randall Dodd, to enquire after Henry and Jane’s health, and Cromwell responded with a note that he had detained Dodd until he could write fresh news, but was sending his own messenger lest she worry as to Dodd’s whereabouts. Cromwell’s associate, Wriothesley, busied himself with finding her a good cook. Before long, Cromwell and Mary appeared to be on such good terms that a rumour began to spread that Henry intended her to marry him. The idea seems hardly credible. Chapuys dismissed it – Henry would never countenance such an idea, and Cromwell had too much sense to get involved in such a potentially dangerous situation. Nevertheless, the rumour persisted and it was one of the grievances brought up by the insurgents of the Pilgrimage of Grace. The idea of their beloved Princess Mary being married to Cromwell, whom the rebels thought the author of all the troubles that had befallen England, was an outrage. Mary continued to take Cromwell’s advice on matters great and small. She deferred to him on whether applicants for her household should be accepted and wrote to him when she had not heard from Henry, to check whether she was writing to her father too often. He sent her a second horse, for which she again expressed her gratitude. At the end of 1536, she was even driven to ask him to arrange for her father to send her some money. Despite having received a quarterly allowance of £40, she could not make ends meet. Shortly after this, Mary joined the court permanently. She wrote to Cromwell from Richmond that since she could not conveniently ‘thank him with [her] mouth’ for his daily goodness, she was writing to advise him of her good will, considering that it was all she had to repay his ‘perfect friendship’, of which she desired the continuance, ‘which, besides the purchasing of my tedious suits, wherewith I do ever molest you, shall be my great comfort’. This pattern of advice, gifts and gratitude continued. In February 1537, Mary drew Cromwell as her valentine and received £15 from him as a valentine gift. Over the years, he gave her a gold salt and she stood as godmother to his grandson. It is impossible to know whether Mary’s protestations of gratitude were genuine, or whether she was playing a longer game. She never faltered in graciously thanking him when he sent her advice – usually about something she had done that might offend Henry, and she obeyed his instructions on what to say to foreign ambassadors carefully – whilst letting them know that she was following orders. If she did see Cromwell as her friend, his sustained attacks on her other friends and relatives, the Poles and the Courtenays, must have disheartened her, especially after the wholesale imprisonments and executions following the Exeter Conspiracy – which was not a conspiracy at all, but the exaggeration of some foolish talk into a serious threat. Cromwell was careful to exonerate Mary from any involvement, saying to Chapuys that the Marquis of Exeter and his wife had tried to suborn Mary, and ‘fill her head with fantasies’. In late 1539, Mary again thanked Cromwell for his interest in her affairs, and his advice to her in the matter of a proposed marriage to Philip of Hesse. She assured him that Henry would find her obedient. Showing her respect for Cromwell, she apologised for not writing her letter in her own hand. In April 1540, she wrote to him on behalf of a petitioner, thanking him as always for his goodness to her and referring to him as her ‘sheet anchor’ – a strangely nautical term for her to use, but indicating total reliance. Whatever Mary’s views about Cromwell, within a few weeks of this letter, she must certainly have been shocked and surprised to learn that he had been accused of treason and hurried off to the Tower of London. One of the accusations against him was the old rumour that he sought to marry Mary, this time with the additional allegation that he would then have tried to usurp the throne. There is no record of her reaction to Cromwell’s death: did she feel some sorrow for the man who had put himself at risk to save her from execution or did she rejoice at the death of a man who had destroyed the monasteries, and engineered the annulment of her parents’ marriage? In the powder keg that was Henry’s court, Mary had learned to walk carefully and keep her true thoughts hidden. Melita Thomas is a co-founder and editor of Tudor Times, a website devoted to Tudor and Stewart history. Her articles have appeared in BBC History Extra and Britain Magazine. Melita has loved history since being mesmerised by the BBC productions of ‘The Six Wives of Henry VIII’ and ‘Elizabeth R’, when she was a little girl. 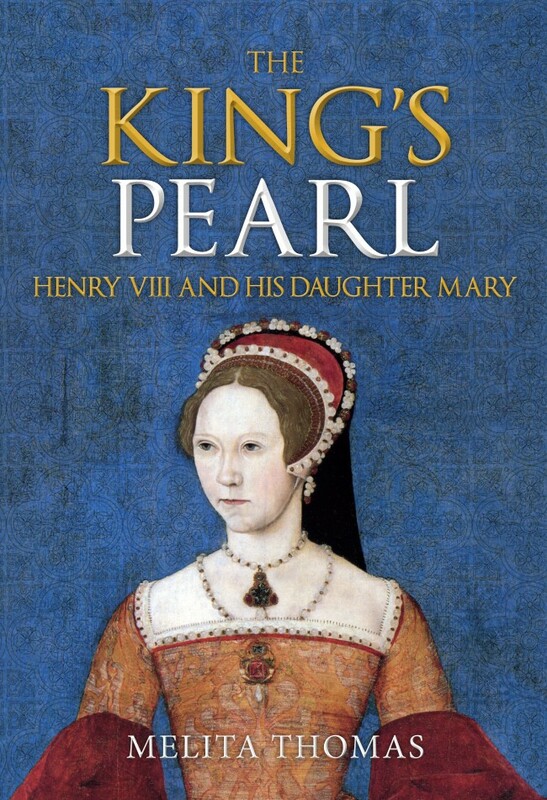 After that, she read everything she could get her hands on about this most fascinating of dynasties.Inspired by the courage of the Lady Mary in fighting for her rights in 1553, Melita wanted to explore the truth behind the stereotypes that surround Mary, resulting in ‘The King’s Pearl: Henry VIII and his daughter Mary’. She lives in Hitchin.